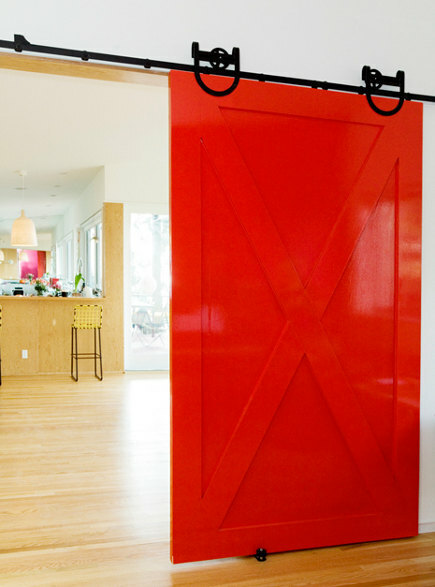 A colorful, interior barn door closes off a space and acts as moveable color block art. 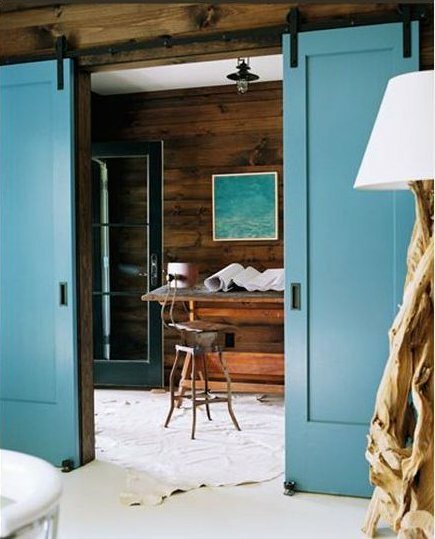 While we often go for exterior door color, the interior barn door is a natural for brining color inside. We adore these doors because they add so much personality to rooms and make relaxed style statements. When painted in vivid hues and black, the interior barn door can reverse the usual relationship of wall and door color. And, as we know, color sends a message. The primary red hue used by California architect Barbara Bestor for a single barn-slider [top] looks modern in part because it’s high gloss. It also suits an open-plan house. The same color also would provide a retro vibe if, for example, it was matte and the crossbuck as the big door X motif is called, was done in a contrasting color, particularly white. 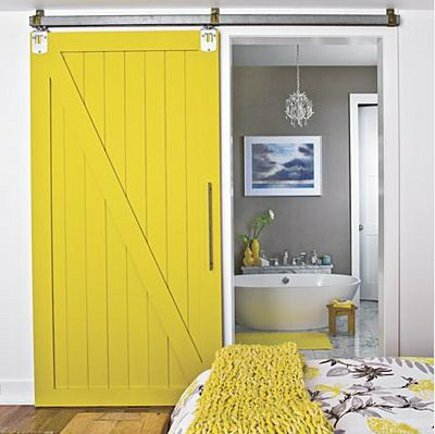 Yellow and gray has such a contemporary feeling (though it was popular in the 1920s) that if you asked me whether a barn door might work with that scheme I would think it risky. Yet this batten door, which has a background texture like vertical siding, reads as hip to me. It also boasts a diagonal slash detail that works perfectly with the décor. What also helps it success is the acidity of the yellow combined with an industrial hinge and contemporary pencil pull. A crossbuck, divided between a pair of doors concealing a laundry area, can have a dynamic visual effect since it becomes a pair of vectors pointing towards the center. The pumpkin color of these doors — Benjamin Moore’s Fresno — is powerful and the satin-finish paint prevents it from looking harsh. I’m not so much an orange person but these look fresh. Against a white wall, this black door, with 3 over 2 lites on top and panels below, adds transparency that gives it almost a whimsical peek-a-boo quality even though it’s the most somber non-color out there. Teal always is a terrific partner for brown tones which can be spotted in the paneled architect’s study beyond. But the narrow scale of this pair of Shaker style panels with inset finger pulls (~hate them~) make them look like switched up pocket doors. Yet, of course, they hover rather than disappear. Allison’s posts on Interior Barn Doors and Decorative Interior Barn Doors also may be of interest. 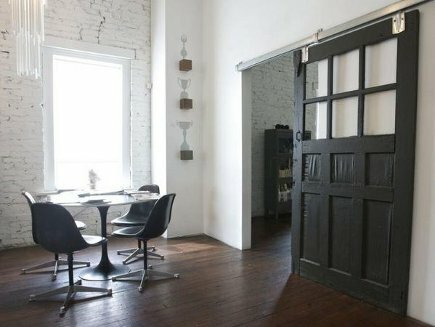 I want these doors but I don’t have a place for them. I wish we had configured a space when we were building! 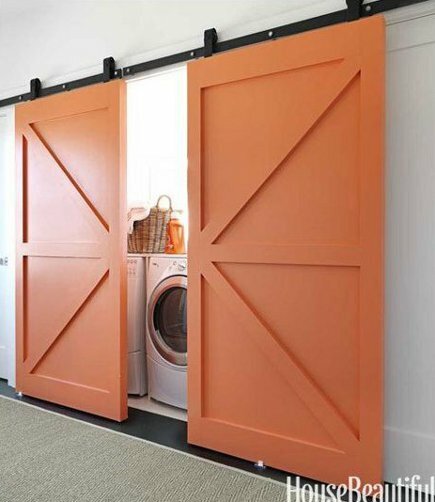 I’ve always loved barn doors, too. Tried to design one between our entry and ‘library,’ but it didn’t fit. I have to say I may be too classic to appreciate the brightly colored versions. I love the dark one by far the most…also the teal, since it has the rustic wood around it.